Ice skating is a fun winter sport, but without ice skating shoes that are comfortable, supportive, and effortless to wear, it may not be as fun as you would have hoped. Believe it or not, choosing the best ice skating shoes is not an easy process. In fact, it can take a lot of measuring, time, and considerations. Not every pair is made the same either, so you have to worry about quality and durability. Fortunately, we have taken the liberty of narrowing down some of the best options with the best price tags. Now, if the time has come to hit the skating rink, you can access some of the best ice skating shoes around. Check out these nine options below and pay attention to the price, support, blades, and price tag. Before long, you can have a shiny new set of ice skating shoes in-hand, ready to go skating. 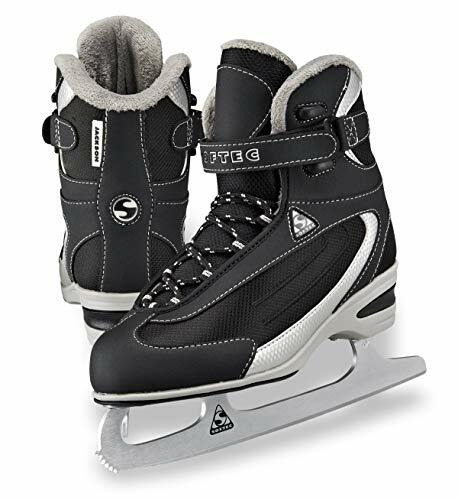 If you or a family member has decided to get involved in ice sports, then you will no doubt require ice skating shoes to get started. Without knowing whether you are going to like the game, you may be dubious about spending a lot of money. With these ice skating shoes from American Athletic, however, you don’t have to pay the earth, but you do get a quality set of boots to last the distance. 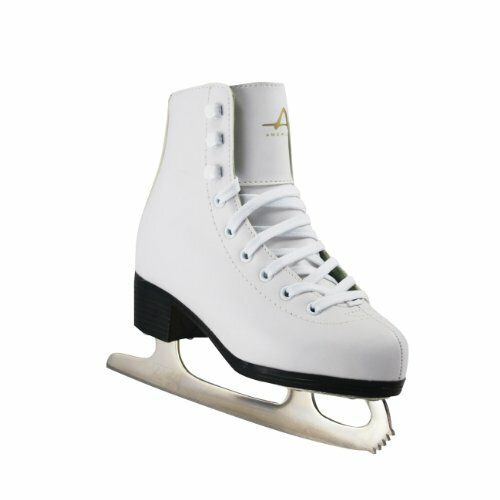 These ice skating shoes are sleek and stylish with a lovely white color, as well as being available in seven sizes to suit your needs. 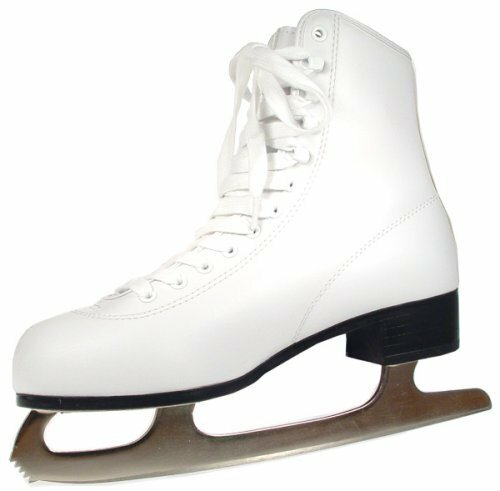 They are of the ‘figure skate’ style so that you can use them on a rink or pond, and they are exceptionally comfortable to wear too. You can benefit from the easy-care PVC material, robust nickel-plated steel, padded tongue, and multi-layered ankle support as well. Everything you need in entry-level ice skating shoes, you will get with this pair. When the time comes to begin ice skating for the first time, set your sights on a pair of boots that will meet the mark for both quality and price. Whether you’re new or experienced on the ice rink, you are going to love being able to wear stylish ice skating shoes from Jackson Ultima. Even though they can take a little getting used to, and are quite stiff when you first put them on, you will soon discover they are every bit suitable for the task at hand. You can skate on a pond or rink with them, choose from 16 different sizes, and buy ice skating shoes for either a toddler, a girl, or an adult woman. There are so many options from which to select. What’s more, aside from size, you have the benefit of a full color variety as well. 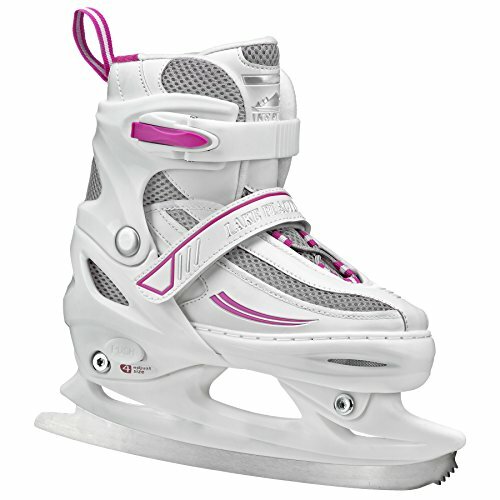 While all the ice skating shoes are white, they feature various accents such as pink, purple, and blue, and the choice of additional fleece. However, the benefits don’t end there. 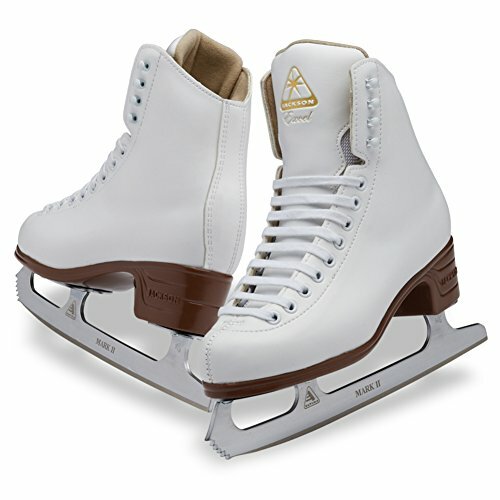 These ice skating shoes are also built to last, thanks to their stainless-steel blades, robust and reinforced vinyl upper, and the inclusion of PVC outsoles as well. You will also appreciate the more delicate details such as the chromed insert, rolled padded collar, and padded tongue. When the time comes to hit the ice for the first time, as a female, then set your sights on these ice skating shoes that will more than impress. If you only want the best of the best when it comes to ice skating shoes, then make sure you take a look at these figure ice skates from Jackson Ultima. As part of the Excel series and suitable for level five beginners, they meet the mark for those who possess a little bit of skating knowledge and experience already. They are built to last, feature robust PVC outsoles and vinyl and mesh construction, and even have light support where you need it the most. However, there’s more to these ice skating shoes than meets the eye. They are built for girls of all ages, from toddler through to adult, and come as one color – white, which is sleek, stylish, and beautiful. 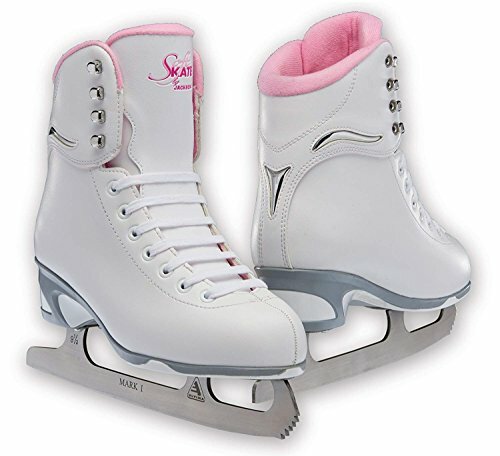 There is also plenty of foam backing for support in these ice skating shoes, as well as the addition of high-quality Mark II blades that come with blade screws. Even though you pay a little more for these shoes than you would others on the market, you will discover why reasonably quickly. They are ice skating shoes that are built to last, taking you to the top of your game. If you plan on going ice skating over the winter months, then treat your girls to new ice skating shoes from Lake Placid. While they are only suitable for hobby use as opposed to proper ice skating lessons, they will meet the mark for your daughter in so many ways. The most standout feature of these ice skating shoes is the sizing. Rather than select one size that your daughter can grow out of quickly, this shoe comes in three sizes which is entirely adjustable. Choose from small, medium, and large, then extend them out as you need to. What’s more, the funky styling and functionality will also have you wanting to purchase these. They are white, blue and pink to suit a range of girls’ tastes, as well as being effortless to put on and take off. Thanks to the quick-fit cam buckles, molded boot construction, and push-button adjustments, they will never need your help to put them on again! Sealing the deal is the quality heat-treated and nickel-plated carbon steel blades, helping you to glide effortlessly over ice with no problems. There’s every reason to consider adding them to your shopping cart today. 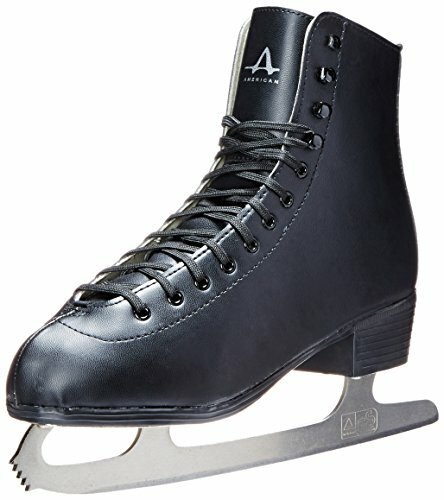 If you’re on a tight budget, but your children still want to go ice skating, then why not give these ice skating shoes from American Athletic a try? While they don’t offer the same level of ankle support as other skates on the market, they can be more than suitable for hobby skating during the school holidays or weekend trips to the rink. They feature a cute pink and white color scheme, come with an easy-care PVC out sole, and are easy to do up with the lace loops as well. Even the blades will impress as they are nickel-plated steel and built to last. What’s more, you can choose from seven sizes and reap the rewards of knowing they are comfortable and well-padded for your children. They won’t be the best choice on the market due to their minimal support, but they will meet the mark for price, comfort, and style, in more ways than one. For a beginner skater, it’s not that easy to find a pair of ice skating shoes to tick all the boxes. You want to make sure they’re affordable in case you don’t end up liking the sport, but you also need them to be comfortable and suitable for skating. After all, not all ice skating shoes work that well on rinks or ponds. This men’s pair, however, will tick the boxes for a range of people. Many customers are drawn to them because of their competitive price tag, but that’s not all they have to offer. You can choose them to be either black or white, then select from 10 different sizes as well. However, you do need to make sure you measure your feet correctly as these are not standard US shoe sizes. When it comes to comfort, you will be impressed with this as well. The skates feature foam quarter padding, exceptional level 20 boot and ankle support, and quilted cushioned lining you can remove, too. Even the blades are something special, from the 2015 model with GR4 blades. Some people say these are not pre-sharpened, so it may be something you need to do before using them. All in all, however, they are an excellent option for beginners looking for new and stylish ice skating shoes. If your children are learning to skate, the last thing you feel like doing is spending hundreds of dollars on new ice skating shoes. After all, they will grow out of them in a few months! While it may seem like you don’t have a choice, if you purchase ice skating shoes from Lake Placid, you do. Suitable for boys, these ice skating shoes are ideal for children who grow out of everything you seem to buy them. Rather than select one of several different sizes, you can choose either small, medium, and large, with a push-button adjustment. By pushing the button, you can grow the shoes by as much as four sizes. Doing so can save you hundreds of dollars in buying new skates. However, the benefits don’t end there. You benefit from exceptional comfort both inside and out, sleek design of black and white for boys, and plenty of ankle support as well. The soles are also waterproof while coming with high-quality stainless-steel blades, woven lining, and soft-tec foam. 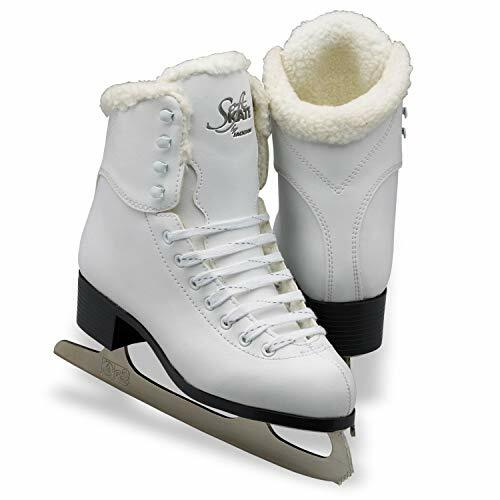 Before you go and open your wallet too wide, consider the benefits of selecting these adjustable ice skating shoes from Lake Placid. When you’re playing ice hockey or going ice skating, you are going to need to buy the best ice skating shoes money can buy. Unfortunately, not everyone has a big budget to cater to this requirement. However, if you check out these ice skating shoes from American Athletic, you will discover they meet the mark for both affordability and quality. They are men’s ice skating shoes, in a black color, and have nine sizes available. You benefit from tie-up laces, versatility with indoor and outdoor use, as well as quality blades. These are performance edge carbon steel which also comes with a nylon blade holder. The design of these ice skating shoes is also stylish while featuring brilliant ankle support and premium levels of comfort. While they can be stiff to wear, they still meet the mark for anyone looking to play ice hockey without breaking the bank. As some of the best ice skating shoes on the market, it’s clear to see why these ice skates for women from K2 are so popular. Not only are they sleek and stylish and available in a lovely black shade, but they come in six sizes and with a range of standout features. Out of everything your ice skating shoes need to be, the most important thing is comfortable. This is where these ice skating shoes excel. They feature support and padding in all the right places, while also coming with Thinsulate lining and water repellent materials. You can have feet that are both comfortable and dry. What’s more, the Boa lacing makes it easy to put them on and take them off. Sealing the deal is the stainless-steel blades, having you glide effortlessly over ice. While you may pay more for this set than others, it’s clear to see they are better than so many other ice skating shoes on the market. Think about how much time you put into shoe shopping for every other occasion. It’s quite a lot, right? Shoe shopping can be quite intense, trying on several different pairs to make sure they feel and look perfect. When it comes to choosing the best pair of ice skating shoes, it’s no different. They must feel and look right, offer comfort in all the right places, and support where you need it the most too. Purchasing new ice skating shoes is not as easy as it sounds, but it can be far more convenient than having to hire them every time you go skating. Before you add any to your shopping cart, however, make sure you think about the following. Comfort is essential, because like regular shoes, you don’t want to be walking around in ice skates that aren’t comfortable. You need to make sure that as soon as you put them on, they aren’t going to be painful to walk in. If you are spending a lot of time on the rink, incorrectly fitting shoes, or those that aren’t comfortable or padded in the right places, will cause fatigue and even injury. Choosing to buy any form of footwear online is never going to be smooth sailing all the time. What’s more, even by looking through product reviews on Amazon, you will find there are a number of reduced star ratings purely because people didn’t pay attention to sizing charts and chose the wrong size. If you don’t do your due diligence and measure your feet, comparing it to the sizing chart supplied by the manufacturer, then you run the risk of being disappointed. The ice skate suppliers will even tell you if the sizing runs large or small, or whether you need to size up or down. You are in danger of ankle injuries if the boots you choose do not offer enough ankle support. Even for leisurely ice skating as opposed to competition sports, you need to have ice skating shoes that meet the mark for ankle support. Otherwise, you may end up in an ambulance with a broken bone. Read the reviews and find out what other people have to say. Often, children’s skates have less support when they need it the most. The material plays a significant role in the decision-making process as well, as it needs to be durable and easy-care. Most ice skating shoes feature PVC to make sure they are comfortable and long-lasting. However, if they are also waterproof with breathable liners, then even better. 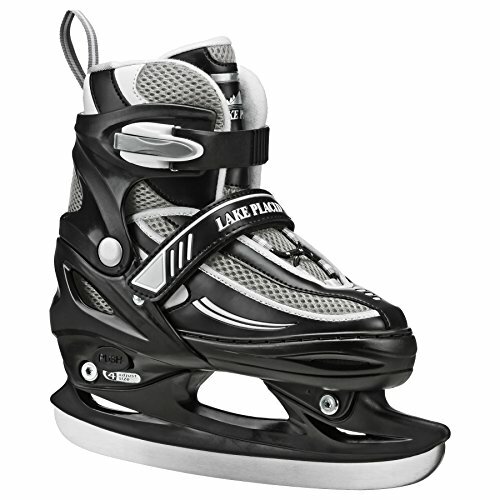 Pay attention to the blades when you are about to purchase a new pair of ice skating shoes. Find out whether they are pre-sharpened, or whether you need to do that yourself. What’s more, find out whether they are stainless-steel or another type of metal.